(Note – If you are a regular reader, you’ll know that I like to label my blogs according to topics – eg. there are 40-odd posts on fasting, 30-odd posts on diabetes, 50-odd posts on obesity/ calories. I do this because I blog about what interests me at the time and it can bounce around a little. This new section, covers mTOR, autophagy and mitochondrial disease, which you’ll see later, ties in very closely with the origins of cancer). Throughout the recorded history of mankind, fasting has been a stalwart of traditional health and healing practices. This is true for virtually all regions of the earth and virtually all religions of the world. The roots of this ancient healing tradition may lie in the the sub-cellular cleansing process of autophagy, which is only just now being unravelled by science. Autophagy is one of the most evolutionarily conserved pathways known to exist, and can be seen in almost all multi-cellular organisms and many single celled organisms. Autophagy refers to the body’s response to a lack of food (fasting) which stimulates a degradation pathway of sub cellular components. By digesting its own parts, the cell does two things. First it rids itself of unnecessary proteins that may be damaged or otherwise malfunctioning. Secondly, it recycles those amino acid ‘spare parts’ into new cellular components. This is one of the big misconceptions of the normal protein turnover – that these broken down proteins are somehow just flushed out of the body even if one is completely malnourished. This leads to the hysterical refrains that ‘Fasting burns muscle’. OMG. If you don’t eat 96 meals per day, you’ll shrivel up and die! Die! Your body stores food energy as fat, but as soon as you don’t eat, you burn muscle. You’ll die! In truth, our bodies are nowhere nearly as stupid as that. Once these old proteins are degraded into component amino acids, our bodies decide whether these proteins are flushed out into the kidneys as waste products, or retained to make new proteins. Proteins are made up of building blocks called amino acids. It’s like Lego. You can break down your old weirdly shaped Lego plane and build a newer, better one using the same building blocks. This holds true in our bodies, too. We can break crappy old proteins down into the component amino acids and use them to rebuild newer more functional protein. 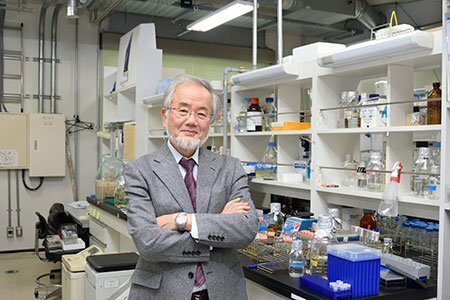 Yoshinori Ohsumi, the 2016 Nobel prize winner for Medicine for research into autophagy titled his Nobel Lecture “Autophagy – An Intracellular Recycling System” , not “Autophagy – How the Human Body flushes desperately needed protein down the toilet because Mother Nature is really, really stupid”. If you need protein, then your body will reclaim the broken down amino acids to make new protein. Of course, if your body has more protein than necessary, then it may certainly excrete the excess amino acids or convert it to energy. While most people think growth is always good, the truth is that, in adults, growth is almost always bad. Cancer is too much growth. Alzheimer’s disease is the accumulation of too much junk protein (neurofibrillary tangles) in the brain. Heart attacks and strokes are caused by atheromatous plaques. These are excess accumulation of many things, but prominently, smooth muscle cells, connective tissues and degenerative materials. Yes. Too much growth of smooth muscle is instrumental in causing atherosclerosis that causes heart attacks. Polycystic diseases like kidneys and ovaries are too much growth. Obesity is too much growth. Certain types of cellular stress, including nutrient deprivation, protein aggregation or unfolding (clumps of protein) or infections will activate autophagy to counteract these problems and keep the cell in good working order. This process was initially thought to be non-selective, but was later shown to be able to selective target damaged organelles (sub cellular components) and invading pathogens. The process was described in mammals, but also in insects and yeast, where much of Dr. Ohsumi’s work was done unravelling autophagy related genes (ATG). He confirmed that this cleansing and recycling pathway was conserved throughout much of life on earth all the way from single celled organisms to humans. Autophagy occurs at a low basal level in virtually all cells, being important in protein and organelle turnover. However, it may be up-regulated to generate nutrients and energy. That is, proteins may be burned for energy in the process of gluconeogenesis, if necessary. Nutrient status, hormones, temperature, oxidative stress, infection and protein aggregates may all affect autophagy in different ways. The main regulator of autophagy is the target of rapamycin (TOR) kinase. This is also referred to as mammalian TOR (mTOR) or mechanistic TOR. When mTOR goes up, it shuts down autophagy. mTOR is exquisitely sensitive to dietary amino acids (protein). The other main regulator is 5′ AMP-activated protein kinase (AMPK). This is a sensor of intracellular energy, which is known as adenosine triphosphate or ATP. When the cell has a lot of energy stored up, it has a lot of ATP, which is a sort of energy currency. If you have lots of dollars, you are rich. If you have lots of ATP, your cell has lots of energy to do stuff. AMPK detects the AMP/ATP ratio and when this ratio is high (low cellular energy levels), AMPK is activated. Low cellular energy = high AMPK so this is sort of a reverse fuel gauge of cellular energy status. When AMPK is high (low fuel), this shuts down fatty acid synthesis and activates autophagy. This makes sense. If your cells don’t have energy, it will not want to store energy (make fat), but instead will want to activate autophagy – getting rid of excess protein and possible burning it for energy. Once autophagy is activated (decreased mTOR or increased AMPK), then 20 or so genes (ATG) are activated to carry out the cleaning process. These encode proteins that carry out the actual process. Since mTOR is a potent inhibitor of autophagy (mTOR acts like a brake on autophagy), blocking mTOR increases autophagy (ie. taking the foot off the brakes). You can do this by using the drug rapamycin, first used as an immune blocking agent in transplantation. This drug was discovered in 1972, isolated from a bacterium Streptomyces Hygroscopicus from Easter Island, also known as Rapa Nui (hence the name rapamycin). It was developed as an anti fungal but eventually found to have immune suppressing properties so gained use as an anti-rejection medication. Almost all anti rejection drugs increase the risk of cancer. The immune system prowls around like security guards, day in and day out looking for errant cancer cells and killing them. They don’t call these cells Natural Killer cells for nothing, you know. If you knock out the security guards with potent anti-rejection medications, then cancer can spread like crazy. And that’s exactly what happens with most of these meds. But not rapamycin. Interestingly, this drug decreased the risk of cancer. The mechanism of its action, by the time of its wide introduction in the 1990s was largely unknown. 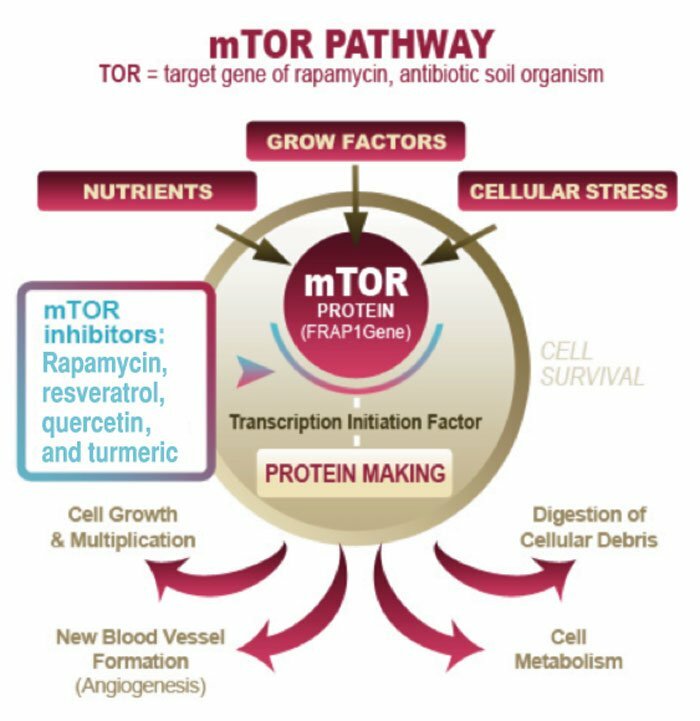 Eventually, using yeast models, the target of rapamycin (TOR) was identified, and the human counterpart was soon discovered – hence the name mammalian TOR, now given the catchy moniker – mTOR. mTOR is found in virtually all multi-cellular organisms and indeed, many single celled organisms like yeast (where much of the research on autophagy is done). This protein is so important to survival that no organism alive functions without it. The technical term for this is ‘evolutionarily conserved’. What does it do? Simply put – it is a nutrient sensor. One of the most important jobs for survival is to link the nutrients available in the environment and growth of the cell or organism. That is, if there is no food, then cells should stop growing and go into a dormant state (like yeast). If mammals sense there is no food, they also stop excessive growth of cells and start breaking some proteins down. If you didn’t do this, you didn’t survive. 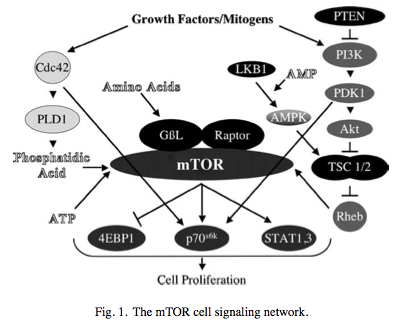 mTOR integrates the signals between food (nutrient availability) and cell growth. If food available, then grow. If no food is available then stop growing. This is a vitally important task that underlies the entire spectrum of diseases of ‘too much growth’ that we talked about previously. It is similar to, but much older than another nutrient sensor we’ve talked a lot about – insulin. But this knowledge opens up an entirely new therapeutic potential. If we have many diseases of ‘too much growth’ (cancer, atherosclerosis, obesity, polycystic ovaries), then we have a new target. If we can shut down the nutrient sensors, we can stop much of this growth that is making us sick. A new dawn breaks. Great post, loved it. Hope to learn even more from you in upcoming posts. I have a question. Is it possible to show, that much of the protein loss, that guys like Phinney and Volek talk about is actually the junk protein, autophagosized cell organelles, extra collagen from the belly, but NOT MUSCLE ? Their only argument against fasting and promoting their way is that “fasting burns muscle”. If we could refute that claim, there would be no arguments left against fasting. Anyone has an idea? Derek, I just visited IDM last week. I would love to hear more of your story (Megan was talking about you alot). Any information you could enlighten me with would be awesome and I could use you as a N=1 case study that other patients would probably love to hear. “Deep autophagy”. How Is defree measured? sure, if you are measuring N loss you are not measuring muscle loss because you do not know how much comes from muscle and how much from junk. But Dr Fung prior posts point to correct papers where muscle loss is measured directly. So yes, most of that N is junk. If you have a relatively clean body you will lose less N. I think Dr Fung though should acknowledge Ron Rosedale as the first or one of the firsts to publish this set of ideas. Good point! Protein is a structural component of many parts of our body, not just muscle tissue. Loss of “junk protein” is beneficial…I remember what NYC looked like when the garbage collectors went on strike, perhaps like many of us that eat more than we need many times day. I use a Weight watchers scale that shows %BF. While I don’t know that the number it gives is super accurate, I CAN say it is extremely useful and very easy to tell if BF is going up, down, or staying the same. I have used these type scales for many years now. They are excellent for telling you which direction your BF is going. A scale just measures weight. To measure muscle mass you also have to measure density. I have a scale which shows BF and also % water weight. Curious if yours shows a change in your water weight as well? Bioimpedance scales are virtually useless when it comes to measuring body fat 🙁 the results are *very* inaccurate. If you want to get a good BF measurement, the best method is a DEXA scan. The weight loss isn’t necessarily muscle mass. It could be water loss and glycogen loss (there is weight involved in that) or general waste loss. My weight can fluctuate 5 or 6 pounds. All depends on my diet and how much I workout. So, to say you are losing muscle mass in 24hrs without doing more measurements, could be misguided. But, every body is different, so you could be losing muscle mass. Rosedale didn’t do the research. He hust learned from it. It’s also not an absolute measurement of protein to mTor. Postgrad Med J. 1973 Mar; 49(569): 203–209. Here is a photo of the man before he started his water fast, and after he completed it 382 days later. It is easy to SEE with our own eyes that he metabolized his own fat and skin, and not much of his muscle. He looks healthy. So fasting does reduce proteins in the body, but eliminates the broken harmful proteins first. Yes, and it promotes stem cells that replace the recycled proteins with new ones during refeeding. Valter Longo detected this clearly in reduced no. of white blood cells during fasting, paired with regrowth during refeeding. Results, renewed immune system. A few MS (autoimmune disease) cases have been cured through fasting. What about a condition like MDS where cells have abnormal morphology? The only cure is a stem cell transplant for a new immune system. Would fasting help? Or more likely your new cells would also have the abnormal morphology? Valter Longo has composed a fasting mimicking diet also, that is claimed to mimick fasting, which could be ideal for you. Probably due to very little protein = low mTOR stimulation, and low calories. I’ve noticed the carbs I can take before getting kicked out of ketosis can be as high as 60-80 gm but less than 10 gm can trigger inflammation, and its sometimes not even net carbs. 10 gm total carbs get some inflammation restarted. So with cancer you may need to get under the threshold of whatever that type of cancer and your limit for that is. Thanks Jason. This is the best explanation of how mTOR works for a layman I have read. I look forward to the next installment. Excellent read, thank you for your effort and promotion of what it takes to be healthier. I’ve fasted for 6 weeks (intermittent!!) and have had significant weight loss while feeling great. I’ve been most surprised at how easy it has been, and I’ve been ranging from 2.5 days to 5 days of fasting. Keep up the great work, I loved The Obesity Code, and thanks again!! Excellent. I think it works for me. My hope is more people benefit. Keep on educating Dr Fung. I recently saw a video https://www.youtube.com/watch?v=v9Aw0P7GjHE&t=1672s in which you were interviewed, Dr. Fung, where you stated that having bone broth during a fast could shut down the process of autophagy because of its high protein content. Could you please clarify the role of bone broth in fasting? Should it only be used for compliance? Should someone who is within 10-15 lbs of their healthy weight fast the same as someone who is morbidly obese? Any light you can shed on the subject would be extremely helpful! Bernard just wondering if you know of any information regarding nutrients as well. I was going to go on an extended water only fast from next Friday after a haemorrhoidectomy and wanted to avoid food for obvious reasons. I was originaly thinking about using collagen, vitamin c and activated b’s, however now I am thinking that definetly leaving out the bollagen and bone broth will be benefitial. Do you think using the vitamins or a fibre supplement (psylium husks) will affect autophagy? Julia, I don’t know about this. If you do several days fasting, start sipping bone broth more and more the last 12 hours or so before you break the fast in order to avoid “refeeding” problems. Else only water, maybe with a little sea salt if the heart beats too fast. Sten, what is the connection between salt and slowing down an over-rapid heart beat? I’ve noticed that I need to sometimes increase salt intake but don’t understand why? I know, or think, that lower insulin means I’m losing fluid and therefore some salt, but not how this affects the heart. Your help would be appreciated. Thank you, Sten. Anecdotes are case studies when they like the result. It’s interesting that many doctors in the low carb world got there by seeing patients who were succeeding that way. Thank you for the pointer! “Anecdotes become “case studies” when the establishment likes the result”, I take it. Many more deaths required before I could become a “case study”. Very interesting article. My grandmother, father and sister all died as a result of PKD. My brother is still alive and seems to have slowed down the progress of his PKD by following a vegan diet. Would you recommend this or should he try fasting as well? Try it intermittently, and reduce protein intake as excess protein is putting pressure on kidneys. Replace with good fats like real olive oil and grass-fed butter. No, Sten, this is a myth: excess protein doesn’t overwork the kidneys. Hello, One question. Does consumption of black coffee and vitamins, namely B12, zink and magnesium and thyroid medicine levaxin hinder autophagi while fasting? What’s the minimum number of fasting hours required to create some autophagy. A very good question! I think the time increases with age, maybe a prime reason it is impossible to “stay young”. When we are young autophagy happens naturally seemingly all the time, because we grow. But growth is not putting new layers on layers but more re-modelling, involving breakdown combined with build-up, hence autophagy is central to youth. When tadpoles transform their swim fin into legs, they do not eat, indicating that the two “modes of operation” are incompatible! Autophagy and growth likely take place during sleep, maybe deep sleep, when we are young. In one of his videos, Dr. Fung states autophagy occurs somewhere between 24 and 36 hours. Correction: 24 to 48 hours. I have done intermittent fasting for almost a year; sometimes a 24 hr fast like Dr. Fung and have noticed no loss of strength or endurance on resistance training at the gym and bicycle endurance on my regular bike runs increased even though I do the same distance (but takes less time). I am a retired biology professor emeritus who developed a class: “The Biology of Obesity, Ageing and Disease” and would definitely add all of Dr. Fungs articles and videos into the curriculum as required reading and viewing. Join the discuss Good Job DOC !! So no resveratrol, turmeric and quercetin while fasting. What about nicotinamide riboside? I read this the opposite way — these inhibit mTOR; so, mTOR goes down and autophagy increases. What a great read. I’ve recently decided to put me and my health first by using Dr Jason’s fasting methods. In 9 weeks I’ve lost all sugar cravings, no more stiff joints, aching elbows and shoulder, 26kg, 3 dress sizes and feel amazing. Thank you for writing your books and sharing with us all. It’s so easy it’s almost beyond belief. I now want to show other people how to do it and would like to find a Dr in Newcastle, Australia that supports this thinking to show there is a better way. Me too! I’ve shared the books with my GP and she just does not get it. It may be worth starting a list of GPs or specialists in NSW (at least) who actually update their knowledge and are not afraid to go against the dogma. There is an Aussie Doctor who ‘appears’ in the Podcasts. Not sure of his name though. He is excellent in weight loss, detox and fasting. was this a water only fast. at what point did you know you had been cured from diabetes what was your measurement ? Excellent overview, as usual Jason. I have forwarded this to several clients. Far too many want and choose to believe the HealthCare Big Lie. Most humans choose to believe lack of obvious symptoms equals health. Most humans choose to believe what may feel good (or decrease unpleasant feelings), at the moment, is healthy. Most humans choose to believe that someone else can & will “cure” problems which our creator has placed directly in control of only the person who inhabits their body. What about a person with MDS with low neutrophil counts? Should they fast or not? And what if they’re receiving weekly shots of a granulocyte colony-stimulating factor that stimulates the growth of neutrophils? Would that affect the results of fasting or would the fasting affect the results of the growth factor? I read a book by Lee Bueno, “Fast your way to Health”. She completed a water only 3 week fast and was cured of rheumatoid vasculitis. She shared stories of tumors disappearing after extended fasts. Why isn’t extended fasting recommended for patients newly diagnosed with cancer? I think because once the cat is out of the bag that we have the best doctor’s inside us for most ailments that are regarded chronic and “lifelong”, much fewer doctors and hospitals are needed. The old saying goes: “1/3 of what we eat feed our bodies while the 2/3 feed our doctors”. Part of Jason Fung’s important contribution is that the important 1/3 is best used with intermittent eating, fasting. The argument is always that normal people won’t comply during a study. Also, doctors are afraid of bad effects of fasting because they don’t know better. That’s why Longo came up with the fast mimicking diet, because the system is more accepting of his approach and more willing to test it and prescribe it. Thank you Dr Fung. Excellent and enlightening post! Yet, Phinney and Volek are deaf until this day. I’m going to try another extended fast. I’m hoping to shrink two metastatic tumors in my lung from renal cell CA. I did a 7 day water only fast and there was no growth in the tumors in 3 months between scans. I was discouraged that they hadn’t gotten smallwe and went back to my old ways. The next scan 6 months later showed a 1mm and 2mm increase in size. I think if I can fast for 21 days or more, I could possibly shrink them. If you want some support you can try joining the facebook Snake Diet Motivation Group run by Cole Robinson. His beliefs are in alignment with Dr Fung although he is very strict (salt water only – no bone broth, coffee, etc) and cusses profoundly. He is however very motivating and “tough love”. He mainly deals with weight loss but a few cancer patients are now joining in. Thank you. From two sources that I’ve read on extended fasts for healing diseases, there are two signs your body will tell you that healing has occurred. 1. Hunger returns, 2. Your tongue is pink and no longer coated with white crud. When I did a seven day fast my tongue was pinkish but also still had a white coating, I know I quit too soon. I’m trying to gear up for another long fast. It’s really true that hunger isn’t the issue when fasting, it’s missing the enjoyment of eating. Thanks, Harold. I don’t seem to have any trouble sleeping when I follow my natural wake/sleep cycle. My husband and I are fasting 12 hours each day and we are losing weight and have more energy and feel a lot better mentally and physically!!! It always puzzled me how Angus Barbieri, fasting for 382 days maintained muscle mass over that period. If anyone had any doubts about protein conservation and recycling, surely the answer is in this post. This guy calls IF “nothingsauce.” Anything to be concerned about? His ideas seem to be on the mark in general. Hi, I’m interested if there is any research or guidelines on how low protein intake should be to trigger autophagy. I have just commenced a water fast, but i am drinking coffee with a small amount of cream in it (amounts to less than 1g of protein 2-3 times a day). Does protein intake have to be 0, or will this still work? Thank you. Great article. But what is the minimum fasting time? I read sooo many confusing things about it. Question – this article uses the term “activated.” How long do you need to fast to “activate” autophagy? (I understand that may vary) and once autophagy is activated, how long must the fast continue to get the benefit of autophagy? Autophagy sounds great what I’d like to know is I take a diet tablet in the morning it helps with starvation. Would this affect the autophagy in any way and reduce the benifits of autophagy?